What Influences Caffeine Levels in Tea? The caffeine levels of teas are often misunderstood and incorrectly listed. For example, many people think that green tea is always lower in caffeine than black tea, and some people think that white tea is naturally low in caffeine. Get the facts about the factors that influence caffeine levels in teas. Although there are many naturally caffeine-free herbal teas/tisanes, there are no naturally caffeine-free "true teas" (teas made from Camellia sinensis, such as green tea, black tea, and white tea). Contrary to popular belief, decaf teas are not caffeine free. They still contain caffeine. There was a popular caffeine myth surrounding at-home tea decaffeination. According to this myth, you could decaffeinate tea at home by steeping it for about 30 seconds, pouring out the tea, and then brewing it again. This has been scientifically shown to be incorrect. It does not decaffeinate your tea. Traditionally, many people have thought of tea caffeine levels as being associated with tea "types," such as black tea, green tea, and white tea. More recently, scientific testing has shown that variations in caffeine levels of different tea types have more to do with how they are brewed than how they were processed into tea. For example, if you brew your white tea at a low brewing temperature for a short infusion time, then it will be much lower in caffeine than if you brew it like a black tea. In fact, brewing a white tea as you would brew a black tea (with boiling or near-boiling water for four to five minutes) could produce a cup of white tea that is higher in caffeine than black tea. The amount of caffeine in green tea also varies from type to type, with its average lower than black tea and only slightly higher than the average for white tea. However, the range for all types of tea is very large, with considerable overlap. Brewing methods and styles can have a large impact on a tea's caffeine level. Using a higher water temperature, longer brewing time, or a higher ratio of tea leaves to water will increase the caffeine level of your brew. Using tea bags can also influence your tea's caffeine level. Tea grades are categories assigned to teas based on how whole or broken the leaves are. Generally speaking, broken leaves will impart more caffeine into your brew faster than whole leaves. Teabags often hold very broken grades of tea, so they tend to have higher levels of caffeine. Tea grades also assess how "tippy" a tea is. The ratio of tips in a tea can also impact its caffeine level. Tea tips (or buds) (the newly formed leaves of the tea plant that are often used to make white tea) are generally known to be higher in antioxidants and nutrients than older tea leaves. They are also higher in caffeine than older tea leaves. In terms of the pure leaf, many white teas from outside of Fujian, China are higher in caffeine than black teas simply because they are made with more tips or buds. Similarly, tippy black teas and green teas will be higher in caffeine than their leafy counterparts. Conversely, tea stems contain very little caffeine. Teas like Hojicha and Kukicha are made from "twigs" (stems) and are naturally very low in caffeine. The Assamica tea varietal is higher in caffeine than other tea varietals. The Assamica varietal is primarily grown in Assam, India and used to make bold, tannic black teas, such as English Breakfast tea. The so-called "white tea varietals" (China's tea varietals #1 and #2) are naturally lower in caffeine (and higher in antioxidants) than other varietals. For this reason, white teas grown from these varietals (such as Fujian silver needles and white peony) are also lower in caffeine and higher in antioxidants than many other teas. However, there are some "white teas" made from other varietals in other parts of the world, and these white teas are not as low in caffeine. One example of this is white Darjeeling, which is made from varietals with higher caffeine levels and is mostly made of tea tips (which naturally contain more caffeine than opened leaves or stems). Generally speaking, shade-grown teas (such as Gyokuro green tea) will have higher levels of caffeine than other teas. This phenomenon has to do with a shift in chlorophyll and other chemicals that occurs when netting is used to shade the leaves from the sun in the days or weeks prior to harvest. 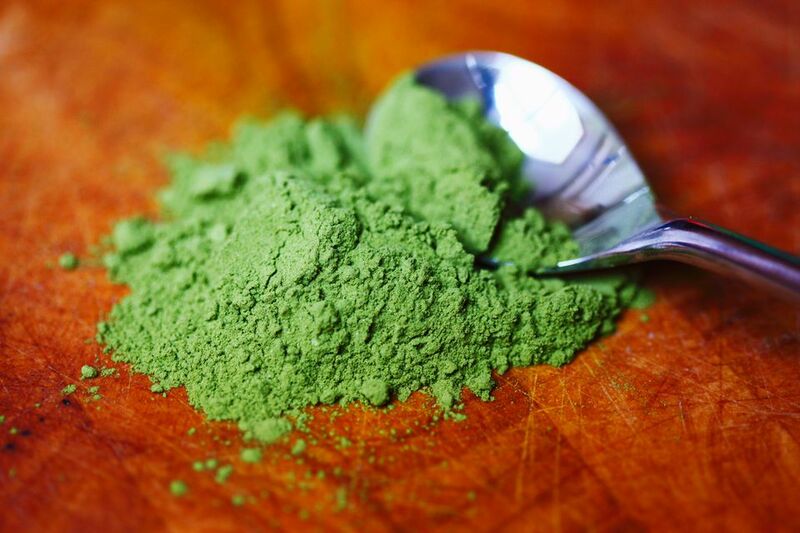 Powdered teas (such as matcha green tea) are usually very high in caffeine. This is because you consume the entire leaf rather than just an infusion of the leaf, so you consume all of its caffeine instead of just some of it. Matcha powdered tea is especially high in caffeine because it is shade grown. Teas that are highly rolled or twisted may release caffeine more slowly than leaves that are flat or open. This tends to apply to certain types of oolong teas, which are typically brewed many times in a gaiwan or yixing teapot. It is not known whether the overall release of caffeine over multiple infusions is comparable to the caffeine release of a single infusion of similar but less twisted/rolled teas. Teas that have been blended with other ingredients (such as mint or masala chai spices) will often have lower caffeine levels than unblended teas. This is because people often brew them with the same ratio of tea to water (such as one teaspoon per cup), but the total amount of tea leaf used is lower, as it has been partially replaced by herbs.